Okey Dokey is a game by Hisashi Hayashi, published by Tasty Minstrel Games. It is for 1-5 players. In this game, players will be working together to create a spectacular music festival. They will have to arrange a variety of vocalists, horn players, bassists, drummers and pianists in the correct formation if they hope to pull of the performance. If the players are able to place each musician in the right place, they will be declared the winners. To begin, players should choose a difficulty level. This sets the amount of Equal cards that will be available during the game. Next the Reset cards should be placed into 5 piles of 2 cards face up in 5 rows. The Musician cards and the Equal cards are shuffled together. The deck is then placed face down on the table. The unused Equal cards are returned to the box. Each player is dealt a number of cards based on the number of players. Players are then able to look at their cards and without revealing any details, they should decide who will be the first player. Once this is determined, play now begins. The game is played in a series of turns, beginning with the first player and continuing around the table in clockwise manner. On a player’s turn, they will take 1 of 2 different actions; play a Musician or an Equal card or place a Reset card. The first action a player can take is to either play a Musician or an Equal card. To do this, the player simply takes a card from their hand and plays it to the 10 x 5 grid following the placement rules. The placement rules affect many different aspects. We’ll discuss this in just a moment. For now, just be aware of the rules. Once a card has been played to the grid, the player draws a card and adds it to their hand. The other option a player can take is to place a Reset card. To do this, the player simply chooses a suit of cards and places a Reset card from that row into the grid following the placement rules. This will be discussed in a moment. If there are no Reset cards left in that row, then this action can not be taken. It should also be noted that if there is already a Reset card in that column, then the action can’t be taken either. The player then may discard up to 2 cards from their hand to the bottom of the deck and then draw the same number of cards that they just discarded. This is only possible if there’s at least 1 card remaining in the deck. Earlier I mentioned card placement rules. Let me explain those now. All the musician cards in a row must be of the same suit. That means that each row will contain a different suit. Each column of card must be complete before placing cards into a new column. That means that there must be 5 cards in a column before the next column can begin to have cards placed in it. Each card that’s played must be equal or greater than the card to it’s left. Reset and Equal cards don’t abide by this rule and may be played regardless. A Reset card sets the value of the row back to 0, allowing any new value to be played after it. In every column of cards there must be 1 Reset card and 4 musician or Equal cards. When the game ends, there should be 2 Reset cards per row. Equal cards may be placed instead of a musician card. In this case, the Equal card is equal to the same value as the card to it’s left. If a Reset card is to it’s left, then the Equal card also has a value of 0. It should be noted that during the game, player discussions should be at a minimum. Players may reveal how many cards they have of a particular suit but may not say or even give hints about the values of their cards. They may suggest a suit they wish to play, but may not show their hand to another player. They may even say that they wish to play a Reset card for a particular suit. The game continues until either the players succeed or they fail. To succeed, they will need to place 50 cards into the grid filling all 10 columns. In this case, they will win. If they are not able to carry out one of the 2 actions mentioned above, then the game ends and the players lose. The game consists of only a deck of cards. The card quality is quite nice and durable. The artwork is bright and fun. I like all the different animal designs on each of the cards. They’re really cute and family friendly. I like that the numbers are quite large and easy to read even from a distance away. This makes it great for people with difficulties seeing smaller numbers. Looking at the game, it kind of reminds me of Hanabi or possibly Rook or Uno with all the colors and numbers. However I like these designs a lot better. Overall the game looks great. It’s a high quality deck of cards that easily carried around. The rulebook for this game is a double sided folded up piece of thick paper. It’s actually quite nice. There are pictures and examples all over it. Everything is laid out extremely well so that it’s very easy to read and understand. The rules look great and are well designed. I like that there are also some hints from the game designer to help players win the game. Overall, there’s nothing to complain about here. This is a quick and simple game to play. However the game itself can be quite difficult to win. Upon first playing it the comparison to games like Hanabi, where you can’t really discuss the specifics of your cards but you can give generalizations, is quite similar. I will say that I like this a lot better than Hanabi though. I know. How could I insult my favorite designer Antoine Bauza like that? Simply put, cause this game is better. It also has some similarities to the game Parade, which I like a good bit, where cards are placed in a row by numbers. However, I like this one better than it too. The thing is, this game has a good bit of strategy to it. If you’re playing it solo, you really have to think about what you want to to do and try not to back yourself into a corner where you can’t make any kind of move. Playing with others, you will find yourself frustrated some times cause you just know that it would have been better if you’d played your card where the other player just placed a card. It’s a beautiful game of frustration that can drive you crazy in a good way. As I said, it has a lot of similarities to both Hanabi and Parade. Fans of those games should most definitely enjoy this one. Solo players that enjoy games like Friday, should like this one as well. Overall, it’s a great game that I think most people will enjoy. I would highly recommend it. 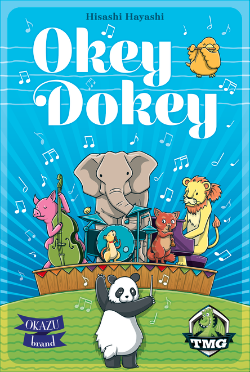 Okey Dokey is a light weight card game of hand management where players must work together without being able to discuss their hand except in generalizations. It’s a pretty quick game to play. Most game sessions last around 15-25 minutes. The cards are bright and colorful. The large numbers make it easy to see, even from a distance. The game is quite simple to play but can be difficult to win. It’s family friendly and fun for families to play. It’s got some strategy to it but nothing that will burn your brain or cause AP. Fans of games like Hanabi, Parade or Friday should really enjoy this one. I highly recommend it. It’s a great little game that can go anywhere. Now strike up the band, it’s time to play. This entry was posted in Reviews and tagged board, board games, card, card games, dokey, games, hayashi, hisashi, Hisashi Hayashi, minstrel, okey, okey dokey, tasty, tasty minstrel games. Bookmark the permalink.